The Volkswagen Phaeton never made sense as a new purchase thanks to high prices and heavy depreciation. But as a used buy it can be a far more sensible purchase because for surprisingly little money you can buy a luxury saloon that’s spacious, fully equipped, comfortable and refined. As the most expensive mainstream production Volkswagen ever, ther Phaeton also comes with fabulous build quality as standard, but even diesel models are thirsty and other running costs can be high. It doesn’t help that this incredibly complex car isn’t always as reliable as you might hope, so don’t expect to run a Phaeton for Passat money. 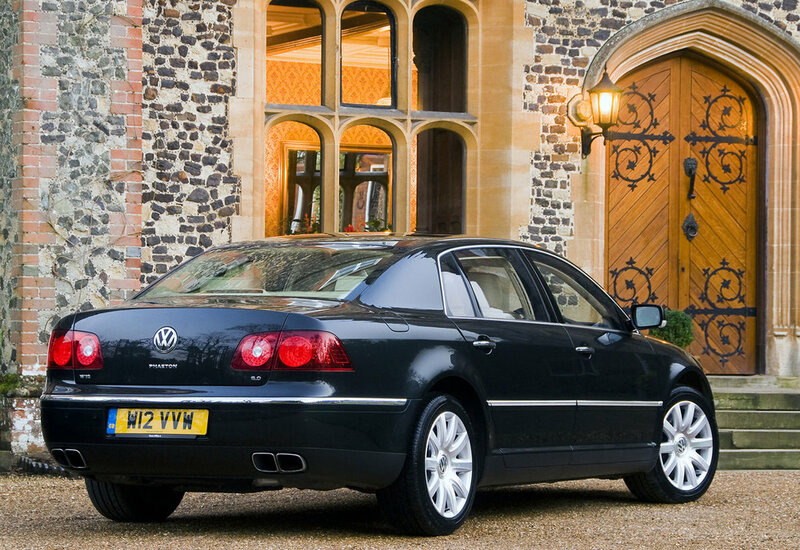 6/03: The Phaeton arrives, with 3.2 V6 or 6.0 W12 petrol engines. 11/03: There are now 4.2 V8 petrol and 5.0 V10 TDi options. 4/04: A long-wheelbase Phaeton is introduced. It’s available with all engines except the 3.2 V6. 10/04: A 3.0 TDi joins the range; it quickly became the most popular model. 1/09: There’s an overhauled interior with revised climate control, new instruments and touch-screen multi-media. 11/09: A further facelift brings a reprofiled nose and extra equipment. There’s now 3.0 TDi power only; a 6.0 W12 is available to special order however. Beware failed headlight bulbs; replacing them is very time-consuming and if you’re really unlucky it may be that an ECU has failed rather than a bulb. There’s a separate motor for each windscreen wiper and failure of one can cause problems with the other if they collide. Some Phaetons have five seats, others have four. Three seats in the back is the most common. Avoid cars without a full service history; even if the history is complete, look at who has done the work. Most Phaeton issues centre on the electrics and electronics, so ensure that absolutely everything works. The wiring loom that runs into the nearside of the bootlid has an outer sheathing. This wears through, potentially leading to short circuits. Footwells can fill with water, damaging the electronics, if the sunroof drain tubes or plenum chambers (at the base of the windscreen) fill with debris.